Color equals nutrition and this salad is overflowing with flavor, color and garden fresh favorites. This Great Garden Salad recipe is from Holly Clegg's trim&TERRIFIC EATING WELL TO FIGHT ARTHRITIS: 200 easy recipes and practical tips to help REDUCE INFLAMMATION and EASE SYMPTOMS. 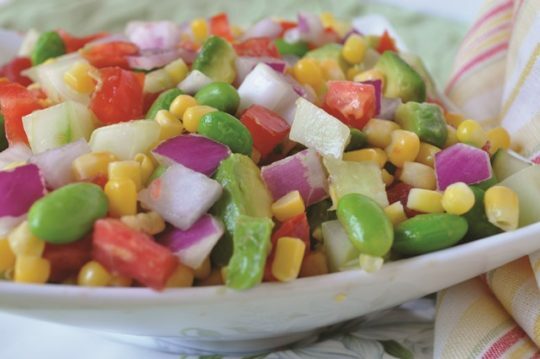 In bowl, combine corn, tomatoes, cucumber, edamame, red onion, and avocado. In small bowl, whisk together lime juice and oil. Toss with corn mixture and season to taste. Terrific Tidbit: Look for frozen shelled edamame in the frozen vegetable section.